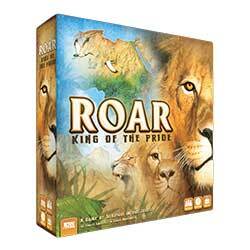 IDW Games will release Roar: King of the Pride, a worker placement / area control game to determine which lion pride is the true royalty of the jungle, on March 7. Designed by Daryl Andrews (Sagrada) and Erica Bouyouris, the game features painted artwork by Vincent Dutrait. Players take the role of lion prides, controlling territory in Africa. Players compete to become the dominant pride by managing their food supply, expanding territory, and growing the size of the pride. Be careful, plans can be interrupted by other prides� secret objectives or the arrival of a new, deadly threat. The box contains 48 male lion meeples, 120 female lioness meeples, 9 hut meeples, 48 secret mission cards, 6 player reference cards, 4 key words cards, 2 scoring cards, 60 baby/cub tokens, 25 food tokens, 15 bonus tokens, 1 first player token, 1 custom cub die, 1 game board and 1 rulebook. The game is for 3 � 6 players, ages 14 and up, and plays in 60 � 90 minutes.